You'll Get The DEEPEST Carpet Cleaning In Dupont! Our industry leading truck-mounted steam cleaning equipment is recognized by the IICRC (Institute of Inspection, Cleaning and Restoration Certification) as the gold standard for carpet cleaning. Additionally, our cleaning process exceeds the standards set forth by the IICRC. No other company in Dupont WA gives you this kind of value for your money. Check out how we transformed this carpet in a REAL house in Dupont, WA. After providing you with an estimate by phone or email, we always do a walk-through inspection of your entire home prior to your service. This gives you a chance to show us any areas of concern such as stains or heavy traffic areas that may need extra attention. We take note of any potential problem areas such as tricky stains or rips. If we think there may be pet stains present, we will inspect the area with our U.V. light. This will allow us to see exactly where the problem areas are if they aren't visible to the naked eye. This is also the time when we ensure that the original estimate that we provided you with is accurate. If the cost will be any more or less than the original estimate, we will let you know. You will always have a written price before we begin any cleaning. 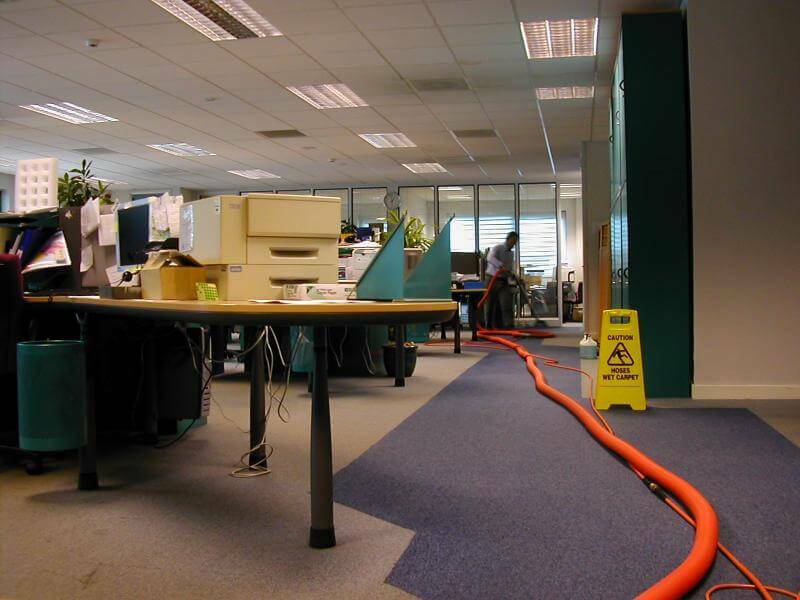 To ensure maximum effectiveness of our steam cleaning system, we first vacuum all areas of carpet. Vacuuming not only protects our expensive equipment from becoming clogged with debris, but it also "clears the way" for our pre-conditioning chemicals to come in full contact with the carpet. Our Dyson vacuum cleaner has two HEPA filters which prevent allergens and dust from being recirculated throughout your home's air. We use the wand attachment to vacuum all the edges and tight spaces, making sure we remove as much dust, dry soil, and hair as possible. If you have pets, we may rake your carpet before vacuuming to loosen up any embedded pet hair. 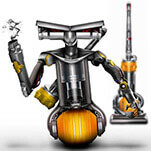 The Dyson's cyclone technology won't loose suction no matter how gunk we get out of the carpet! Depending on your carpet type and its severity of soiling, we choose the appropriate pre-conditioning agent to apply. Connected to our truck-mounted water line, we attach a jug of concentrated chemicals which are automatically diluted to the proper amount. Then, we apply them to your carpet with a triggered pre-spraying gun. 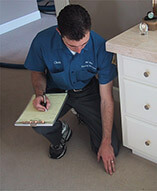 Whether your carpet is lightly soiled, heavily soiled, grease-caked, urine soaked, etc. ; we've got the right juice for the job! 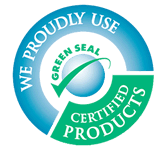 We have a complete set of environmentally friendly, green carpet cleaning chemicals that we can use if you are sensitive to traditional cleaning chemicals. Agitation is a vital part of the process. If you've got stubborn, caked-on dirt, the only way to ensure that the pre-conditioning agent(s) are penetrating deeply is to agitate them into the carpet. Depending on carpet type and condition, we have two methods of agitation. This tool is our primary agitation device. It does a good job at perking up carpet fibers and ensuring that the pre-spray contacts every fiber. It also helps to break up any crusty or caked-on debris like gum, wax, or other difficult spots. 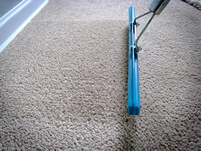 We use the carpet rake on lightly to moderately soiled carpets. We save this method for the truly filthy carpets in need of serious restoration. We work the pre-conditioning chemicals into the carpet with (2) six inch scrub brush heads attached to our Rotovac Powerwand. While this does take a considerable amount of time, nothing does a better job at loosening up tough soil. This wand is known in the industry to be one of the best wands ever manufactured. Its (4) solution spray jets and two inch vacuum tube allow us to take full advantage of our truck-mount's water output and recovery system. We use the wand on lightly to moderately soiled carpet. We also use this wand on delicate rugs, commercial carpet, and some berber carpets. Our patented Rotovac is one of our favorite tools. There is nothing on the planet that provides the level of cleaning that the Rotovac delivers. Featuring (3) steam jets, (3) vacuum ports, and (3) agitators on each counter-rotating head, the Rotovac is the only solution for severely soiled carpets in need of serious restoration cleaning. We will re-inspect the entire carpet to check if there are any remaining spots or stains. If there are, we treat them with the appropriate chemicals, the re-steam clean the area. 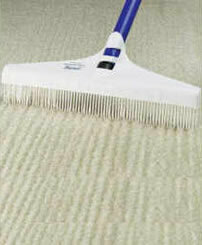 Now that the carpet is as clean as can be, we groom it with our carpet rake. This helps to eliminate lines and footprints left by our equipment and technicians. Also, it helps to erect each carpet fiber which creates a very professional, uniformed appearance while also ensuring a speedy dry time. How would you like a carpet rake of your own? We'll now sell you of our carpet rakes for your own personal use! These rakes are AWESOME to use prior to vacuuming as they help to loosen up embedded soil and hair that your vacuum cleaner would otherwise be unable to remove. While this step is optional, we urge our clients to opt for 3M Scotchgard Fabric protector. Not only does Scotchgard help prevent spills and spots from becoming permanent, unremovable stains, but it also extends the life of your carpet by protecting from daily foot traffic. When applied, Scotchcard creates a non-sticky, non-toxic barrier on top of each fiber. On average you should have protector re-applied every six months. We also have three other "final step" carpet treatments. For carpet owners who suffer from allergies, our anti-allergen treatment can make a huge difference. This final-step treatment is a safe and effective way to control indoor allergens in your carpet and upholstery. Responsible Care's Anti-Allergen Treatment helps fight and prevent allergies caused by dust mites, dust mite droppings, dog dander, cat dander, cat saliva, cockroach droppings, and more. When this product contacts any of these allergens, they are immediately denatured and have significantly less "binding power" thus greatly reducing or eliminating the allergic response to these allergens. This treatment is composed of natural extracts from fruit seeds and plants. When properly applied, our Anti-Allergy treatment lasts up to six months. Steam cleaning itself kills 99.9% of germs thanks the 210 degree water from our truck-mounted system. But what about controlling germs between cleanings? Microban germicical treatment helps to control the growth of bacteria, fungi, and viruses. Microban meets EPA standards for killing HIV-1 (the AIDS virus), Herpes Simplex 1 and 2, and all Influenza Type A viruses including H1N1 (Swine Flu). This treatment can be a great decision if you have young children who spend a significant amount of time on the carpet. Our deodorizer treatment is one the best in the business. Thanks to its alcohol base, it doubles as a sanitizer. The deodorizer treatment is effective on all of the following: urine odors, airborne malodors, skunk odors, smoke odors, bacteria and fungi odors, sewage odors, and odors from mold and mildew. Unlike some companies, we do not use enzyme deodorizers. We've found that this alcohol-based deodorizer is much more effective! For people who'd just like their home to have an extra pleasant smell after we're done cleaning, we offer complimentary air freshener after any service. Looking For Dry Carpet Cleaning?...We Do That Too! Although truck-mounted steam cleaning is our primary method of cleaning carpets, we also offer dry carpet cleaning. Sometimes called "green carpet cleaning," this method involves very little water and typically dries within just 45 minutes. This method can be useful in establishments where an ultra-fast dry time is needed. Dry carpet cleaning can also be a nice "spruce up" between steam cleanings. We do not recommend this type of service for extreme soil levels. Be sure to check with your carpet manufacturer about whether dry carpet cleaning is an acceptable form of cleaning to satisfy your warranty. There are some manufacturers that require steam cleaning in order to keep your carpet's warranty valid. If you have brand new carpet that has never been cleaned before, we recommend steam cleaning followed by the application of Scotchgard protector. This will both get rid of toxic chemicals caused by the production process and will protect your new carpet spills as well as wear and tear. We have a wide variety of equipment and systems to meet our commercial clients' needs as well. We even have a fully self-contained steam cleaning system which enables us to work in buildings which must remain closed and locked. Our steam cleaning system allows us to clean deep while our dry cleaning system leaves the carpet dry within 45 minutes while still delivering great results! We clean banks, hotels, day care centers, restaurants, gyms, offices, doctor's offices, stores, and more!